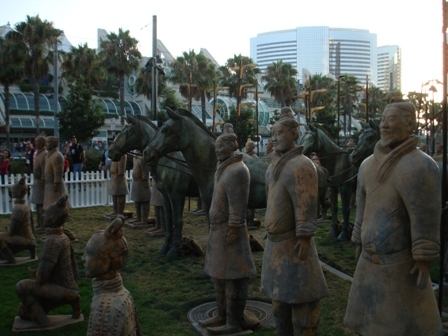 Here are some more pictures from Comic Con, the biggest pop culture event in, I think, anywhere. It’s immense! 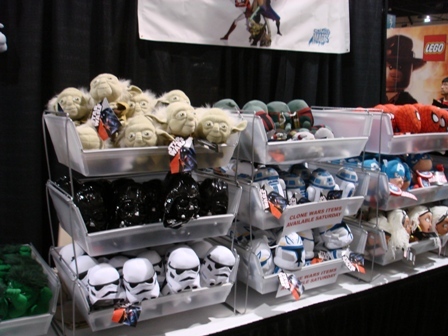 Here are are looking from one end of the dealer’s room toward the other, Aisle 100 to . . well, it’s not really Aisle Infinity, but it seems like it. 4500, maybe? Ten points, by the way, if you correctly ID the source for the photo caption. that were there in in the service of the new Mummy movie. This fellow was promoting something, a TV show, I think. 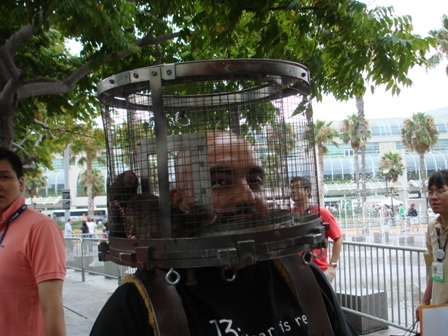 The rats seemed happy enough. 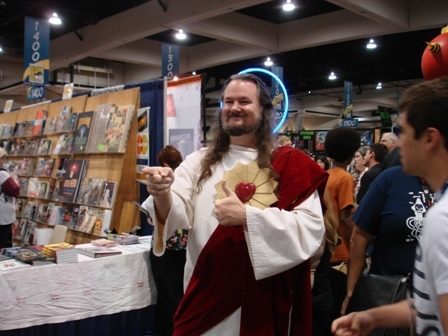 of Buddy Christ, complete with neon halo. including these limited edition Daleks. 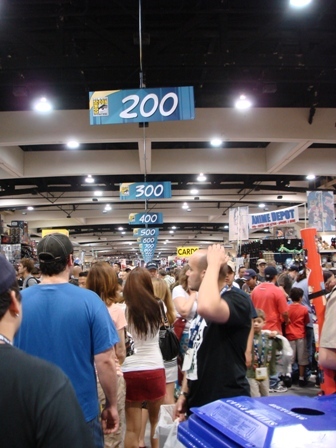 Another thing about Comic Con is that many actors from TV and movies show up, either to promote shows and movies, or just to hang out. 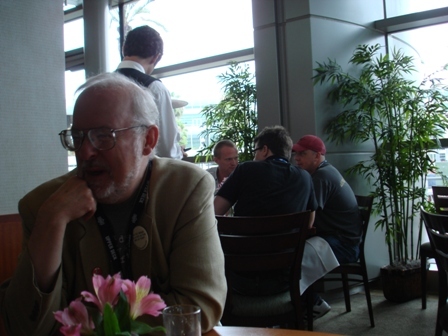 We were having breakfast one morning and there, just behind Greg’s shoulder was Paul Bettany, who I totally Kinneared. He’s the one at the next table to the left of the left-hand fellow in the black shirt. The vaguely zoomed-in version wasn’t in focus. The sock even had a sighting of celebrity shoes. 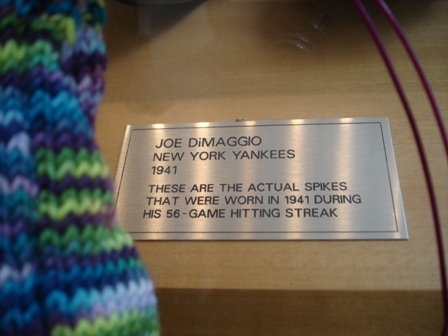 Here’s a close-up of the plaque. 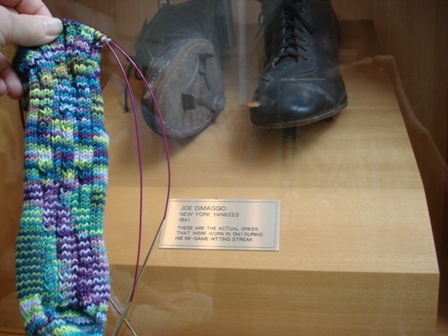 Would he have hit 57 if he’d had hand knitted socks? 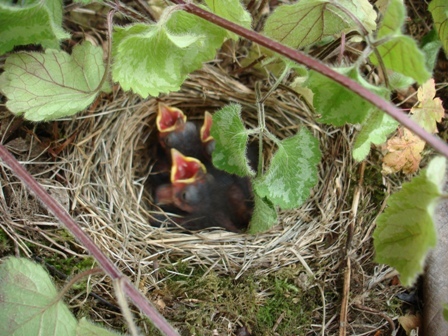 While we were gone, the junco eggs hatched, and we now have three baby birds in the nest. They are absolutely silent, but when they sensed me nearby, they popped up their heads and opened their mouths for food. I snapped a couple of pictures and left them awaiting the mother bird’s return, and hope she’ll have some nice fat insects for them. The plants in the basket are getting rather limp, as I haven’t been watering them at all, but there was a little rain yesterday. They are just weedy volunteers and I’m not concerned about them, but they do give a little concealing coverage to the nest. view of Los Penasquitos Marsh as we visited friends. It looks so relaxed, doesn’t it? 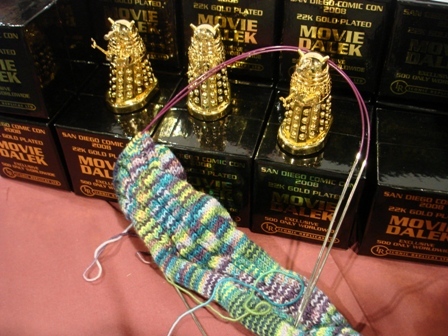 As I mentioned, we went down to Comic Con to start the in-person promotion for Greg’s new book, City at the End of Time, but there was also some knitted content to the event. 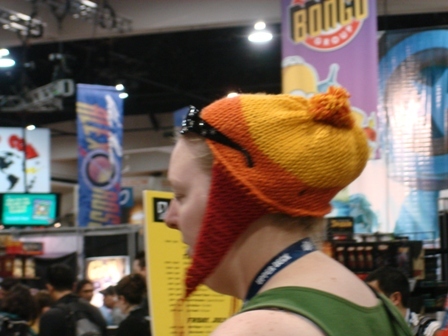 There were quite a few Jayne hats, many from the kits or purchased, like this one, but some done free-hand, as it were. 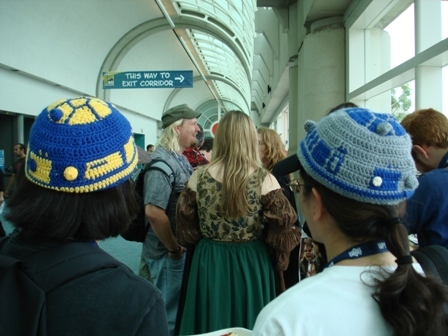 There were these cute crocheted R2D2 hats. But the most amazing thing was this Wonder Woman costume, designed and knitted by the wearer, Chris Wass, pattern available in her Etsy shop. Now I am not one who would wear something like this, but she totally rocked the look, and had the confidence and chutzpah to pull it off. 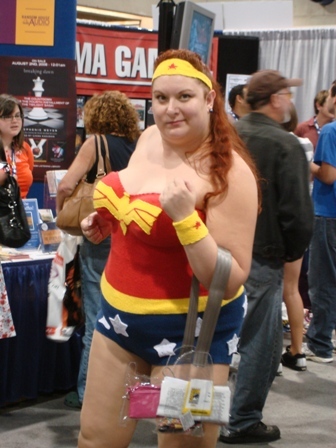 You go, Wonder Woman! A Junco of some sort or other has taken up residence in a hanging basket in the corner of the front porch, building a tidy nest out of dried grass. I think might be the slate-colored form of that bird — I didn’t realize there were so many types! If you peer closely just left of center, you’ll see a hole in the foliage; to the lower left of the hole is a darker area with a yellow speck — that’s her head and beak. 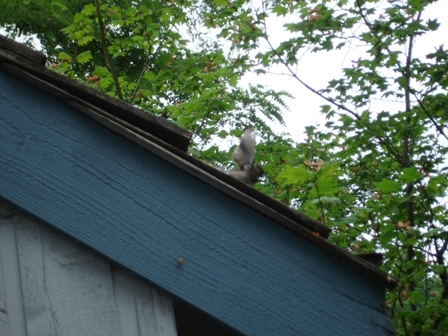 She’s a bit of a nervous mother and doesn’t like people hanging out and leaning in within six feet for so, so just after I took that picture she fluttered up to the roofline and made tiny fierce “tick! tick!” noises to drive me off. As it was time for our annual Clarion Party yesterday, I moved the tubs of iced drinks off the porch, barricaded a large space around the hanging basket, and posted signs asking people not to linger in the area. She’s still there today, so I hope to have pictures of chicks soon. That same basket was nested in two years ago, but the brood had flown off by the time we held our party. Nesting is later by a couple of weeks this year, probably because of the cool, wet, long spring we had. I love going into the summer garden to smell the roses. 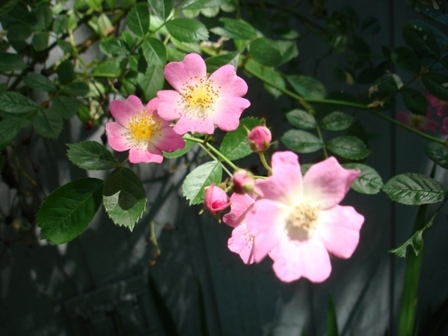 I don’t have many — the Seattle climate can kill a lot of varieties — so a rose that can do well for me is hardy, strong thing. I’ve forgotten the name of the one above. 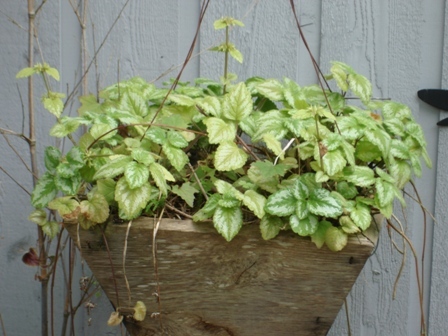 It was gift from Jon Singer, (yes, of course you know him), one that he propagated from a cutting. I recall that it’s a person’s name . . . look familiar to anyone? Very scented, just delightful, and the blooms always make me think of small cabbages; a Brussels sprout rose, perhaps, as it is not big enough to be a true cabbage rose. 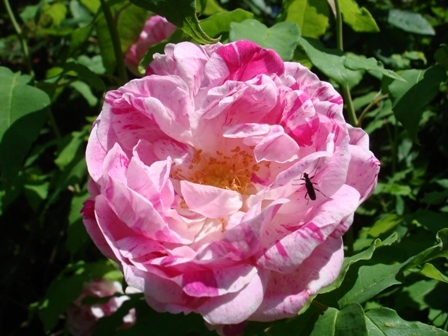 A vintage rose, climber-ish in form, but not wildly so. I love the stripes. This is Evangeline, and the variety dates back to 1906. a vigorous climber that covers itself in these tiny single roses in July. Lightly scented, the merest hint of fragrance. There are a couple more roses, I’ll try to show them another time. 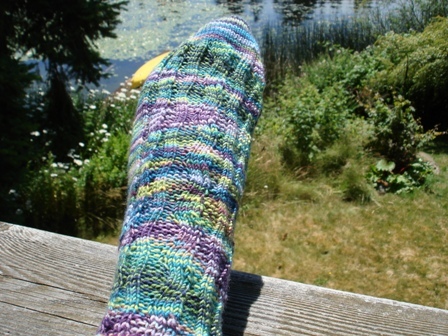 Besides weeding and pruning, I’m been working more on my first pair of socks for Summer of Socks. 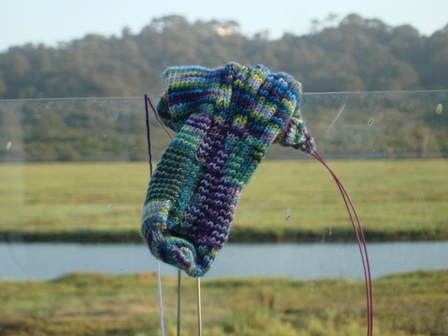 The first one is now done, and I’m just starting the increases on the second of the pair. The colors are quite summery, aren’t they? But the yarn is a bit too heavy to wear on a warm day. I came up with a good quick dinner the other night: Take chicken thighs, and loosen the skin from the meat. Smear in a generous amount of Mustapha’s Harissa — it’s not a wildly hot harissa, but use your own judgement here. Slip a thin slice of fresh lemon under the skin, put into a lightly oiled baking dish, and bake at 350 till the meat is done and the skin is getting crispy, about 40 minutes. Spicy, tangy, with a citrus edge — really good!